Invite for a talk in Boston this Thursday, August 13. Please join us for AN EVENING OF HOPE AND GOOD FORTUNE. Jennifer 8. 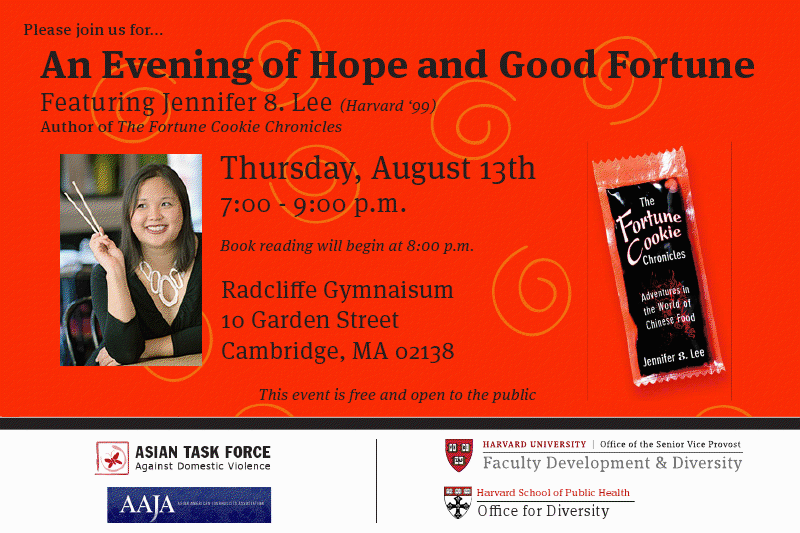 Lee (Harvard ’99), New York Times journalist and author, will read from her book The Fortune Cookie Chronicles, in which she takes readers around the world (and almost every American state) in her quest to understand Chinese food and the people who make it. This event is sponsored by the Harvard University Office of Faculty Development & Diversity and the Harvard School of Public Health Office for Diversity in partnership with the Asian American Journalist Association. Thursday, August 13, 2009, 7:00 â€“ 9:00 p.m.
Refreshments and Hors d’oeuvres by the Hong Kong will be provided. For any questions or additional information, please contact Kozue Sawame, kozue@atask.org, or 617-338-2350 x232. Please RSVP to Mengdi Wang, 617-338-230 x223, or mwang@atask.org.